Straight out of the box Elder Scrolls Online needs a little bit of love in several departments. Fortunately the gaming community have taken to creating some excellent mods already. Although we’ll continue to add to this list, here are the top five essential add ons to get you started. Installing Addons in Elder Scrolls Online is super easy. 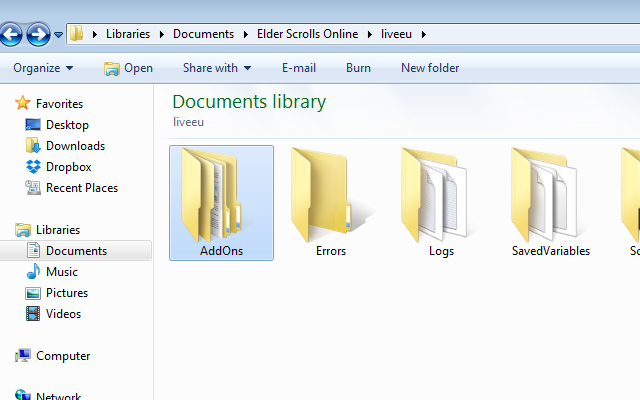 Firstly, you need to locate your Elder Scrolls Online folder in “My Documents”. Once inside it you’ll see an “Addons” folder (if there isn’t one, just create a file called Addons). All you then need to do is download the Addons and drop them into this folder. When in game, simply type /reloadui and you’re up and running. Elder Scrolls doesn’t, by default, come with scrolling combat text. If you’re unsure what that is, it’s basically a visual cue as to how much damage you and your opponent deal to one another. Numerical values during combat will fly off an enemy or yourself, providing you with information as to how much damage you’re dealing. Installing this mod is a question of information over immersion. The default UI for Elder Scrolls Online provides no numerical information as to how much damage you heal, how much stamina you have or what your health is as a %. Foundry Tactical Combat or FTC as it is commonly known provides accurate numerical information while also redesigning the basic user interface. What I like the most about this mod is the fact it’s minimal, has been tastefully done and doesn’t attempt to redesign the wheel. The new UI you’re presented with looks great and provides all the information you need while making a massive difference to combat. As an individual who always uses Auto Loot in MMOG’s, it’s frustrating in Elder Scrolls to not see what you pick up when you have it turned on. Fortunately there’s a lightweight addon for it. 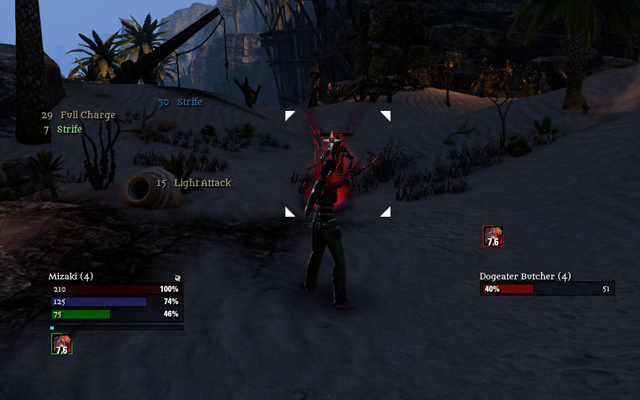 Loot Drop simply shows in the lower right hand corner of the screen the experience and items you acquire from an enemy. Simple. Soul Gems in Elder Scrolls Online are used for resurrecting yourself and allies. In order to fill a soul gem, the Soul Trap ability must be used. With the current UI though, it’s difficult to know how many Soul Gems you actually have. Soul Gems provides a visual and numerical counter that you can place anywhere on your screen, it also allows you to customise what you want to see and how transparent it is by going into settings. 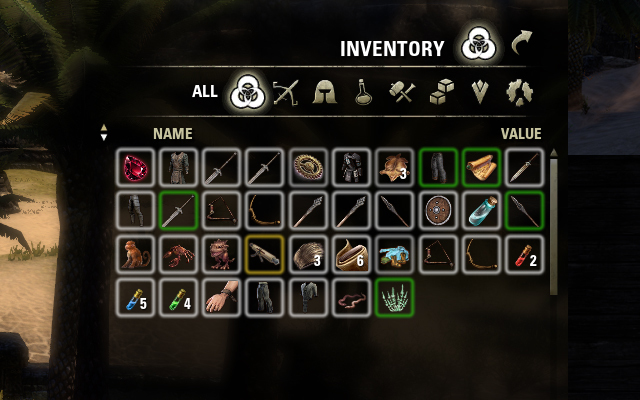 Similar to Skyrim, Elder Scrolls Online provides a list based UI which means a lot of scrolling and not much efficiency. In addition, the default UI doesn’t color items based on their rarity making sorting through your belongings a lengthy task. Inventory Grid View fixes both these problems instantly by placing your inventory, as you might expect, in a grid, while also coloring all items and their rarity. A very minor addon that adds makes tracking your experience easier. It prevents the experience bar disappearing when you close your user interface and it also provides a progression %. If you’re like me and want to know how close you are to leveling, it’s a must. I also like the fact it isn’t in your face like some of the alternative experience addons. If you want Elder Scrolls Online to function much more like a single player RPG, to be fully immersed in the game world, you really can’t go far wrong with Wykkd’s Full Immersion addon. It basically strips the game back to its bare bones and removes all elements of the user interface, compass and more. For anyone wishing to swap roles quickly Outfitter is pretty much a must have addon. It allows you to quickly swap and change roles and equipment with the click of a button from within the skill menu. Well worth having if you’re a hybrid or when leaving PvE for AvA.